The Princess Cut Diamond is a brilliant style shape with sharp, uncut corners. It is typically cut square rather as a rectangle. Brilliant style refers to vertical direction crown and pavilion facets instead of step style horizontally facets. This cut generally has 76 facets, giving a lot of brilliance and fire as the round brilliant. This cut along with the Cushion cut are one of the most on round popular cuts in the United States. In the search below no field is mandatory, you may select the budget to get results. Which you may narrow the results by limiting any other fields, to get an eye clean and white diamond you may choose H or better color (D to H) and SI1 or better clarity (IF, VVS or VS), if you are one budget that does not give results go down to SI2 which many are also eye clean or go down with the color to I or J. It may be second or third in popularity to the round brilliant cut, but the princess cut diamond is one of the most popular of all the fancy shapes we have today. Since it has a sparkle that is equivalent to the round brilliant cut, they make an ideal alternative to the latter. Owing to their flexibility they make a great choice for any style of ring. Princess diamond has its root in the 1971’s Barrion cut diamond. It was the work of Basil Water Meyer of South Africa and comprised of 81 facets which was accompanied by a 4-fold mirror-image symmetry. In the same year, the ‘Profile Cut’ by Arpad Nagy a London cutter was patented which was eventually followed by the emergence of the ‘Quadrillion cut’. With the passage of time several new versions of the princess appeared and gradually owing to the booming technology and new experiments the modern princess took birth. Today’s it contain facets ranging anywhere from 53 to 144 though it may vary depending on whether the shape is a perfect square or an elongated square and on the way the pavilion is cut. Ideally it features either 58 or 76facets. 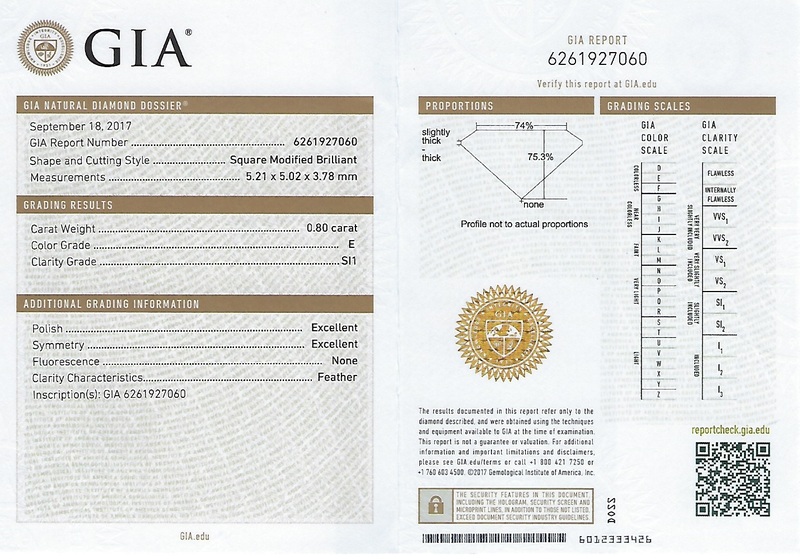 It is a square version of the round brilliant cut and is also referred to as the square modified brilliant. They are a type of ‘mixed diamond cut’ or what is also known as the ‘modified brilliant’ that blends the techniques of modified brilliant cuts and step cuts. While the face profile of the princess is either square or rectangular, the side profile resembles the look of an inverted pyramid with four beveled sides. This unique pyramidal side shape is responsible for the superior light dispersion, which remarkably cover up the many flaws hidden inside the stone. The traditional princess diamond is square, though in the modern era, we find most of them inclined towards a more rectangular side. The latter is slightly lower in price than the former. This cut has sharp edges or delicate corners which make it susceptible to chipping. Hence, it is advisable to opt for a prong setting which will not just protect it from chipping but will also hide the inclusions hidden therein. Princess diamond of slightly lower clarity and color makes for a terrific option as they are not only affordable, but overshadows the small imperfections perfectly and render an exceptional fire and flash. Unlike the round cut, less material is wasted during the making of this diamond and hence, they are usually cheaper per carat than the round cut diamond. 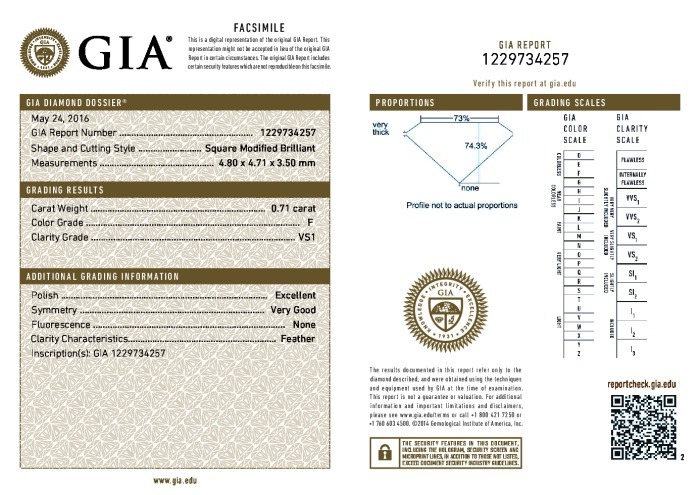 While buying a princess cut diamond jewelry, you will first need to ensure that the corners are well protected because as mentioned above they are very weak. Secondly, look for a princess whose total depth is about 70% of their width. From the top the diamond should look square. Remember, only the best cut diamond will maximize the fire and brilliance. Lastly, make sure that the diamond has been certified by the EGL, AGS or the GIA.